All you need to know, plus answers to what the fuss is about vaccination and Ibuprofen. An incredibly infectious illness caused by a virus. So infectious that 90% of people (that have never had chicken pox before) who come in contact with someone suffering from chicken pox will get it too! 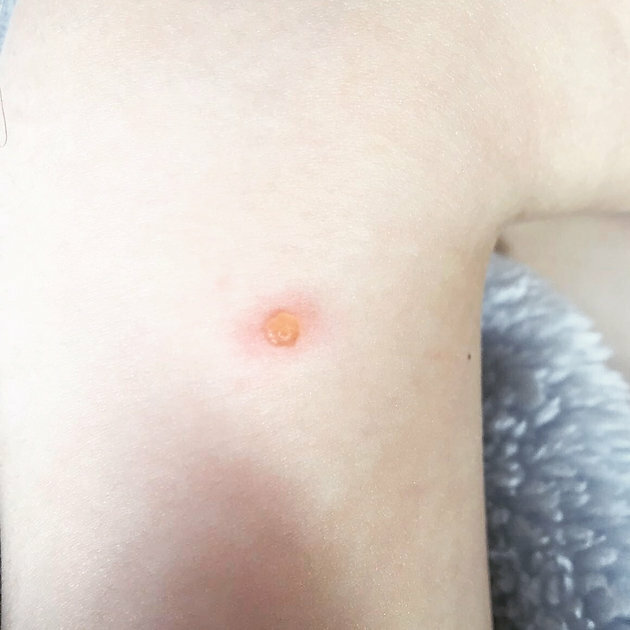 As you can see from the photos of my friend’s 2 yr old – many children smile (and scratch) their way through this infection, so it is considered to be a relatively mild condition of childhood. 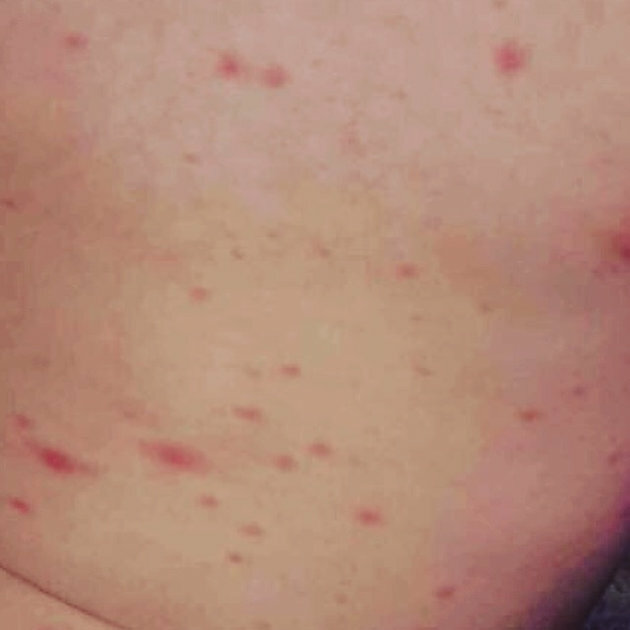 Typically from 1 to 2 days BEFORE the rash has appeared. So if your child gets chicken pox, you should inform the people he had contact with in those 2 days before the rash came up. In particular inform school/nursery, anyone that may not have had chickenpox before, pregnant friends & relatives and also anyone that may be immunocompromised (undergoing chemo for example). How long is it infectious for? Usually 5 or 6 days, by which time all the spots will generally have crusted over. As the rash may hang around for some time – do get a letter from your doctor to take with you if you are travelling in case anyone questions whether you are okay to fly or not. This is how the lesions look when they are infectious, with no crust on the top. There is a lot of fear around contracting chicken pox in pregnancy. 90% of women will have had chicken pox at some point before becoming pregnant and so are immune and therefore their pregnancy won’t be affected by it. For those women that are not immune and who contract chicken pox in pregnancy, there is a10% risk of the mother becoming quite unwell with it and 1-2% of the babies then born will have skin, eye, limb or neurological abnormalities. It is worth noting that a) the risk of harm to the unborn baby is there up to 28 weeks of pregnancy, thereafter it seems the baby is not affected and b) there is no increased risk of miscarriage if the mum gets chickenpox in pregnancy. Chicken pox can also be dangerous in pregnancy if the woman catches it from 7 days before the baby’s birth and onwards. This is because when the baby is born they can come in contact with the virus and so get infected with chickenpox. If you are at all concerned about this, speak to your GP. There is a blood test that we can do to check if you are immune or not to chicken pox. There is also treatment that we can give (to mum and to baby) if needed. Although chickenpox is generally a mild condition that rarely causes complications, it isn’t completely harmless either. – Scratching at the itchy spots can cause them to become infected. – Scarring as a result of the spots and picking at them. – Some children get spots in the mouth. This can be very painful and make eating so uncomfortable that they refuse to feed. This then puts them at risk of becoming dehydrated and very unwell. Do keep an eye out for this. – Infection of the brain (encephalitis) or the lining around the brain (meningitis). So if your child gets chicken pox, be alert to any changes in behaviour/drowsiness/fits and any shortness of breath/coughing. Why infamous? Well because it has been in the press a fair bit recently due to people questioning why it is not part of routine immunisations. Those that are pro the vaccine say that besides the itchy discomfort and risk of scarring to your child, there is a risk of complications from chicken pox, so why risk your child catching it if it can be prevented? Not forgetting that taking the time off school/work is difficult and inconvenient for parents/carers. It has been shown to be a safe vaccine and the US have been vaccinating since 1995. In the US they have found that 100% of serious complications from chickenpox are prevented by the vaccine. So why are we not all vaccinating against chicken pox? 1) If all children are offered the vaccine routinely then it means that anyone who does not have the vaccine in childhood will be at risk of catching the disease at some point in adulthood.Chicken pox can be very severe in adulthood. 2) When adults who have had chickenpox in childhood are exposed to a child with chickenpox- it gives their immune system a boost against shingles. Shingles is caused by reactivation of the chickenpox virus. The chicken pox virus can remain asleep within our bodies once we have fought chickenpox off and then wake up at some point later in our life manifesting as shingles. What if I want my child vaccinated? You can have your child vaccinated privately. This comprises of 2 vaccines and in 90% of children it is successful in preventing them ever catching chickenpox. NB It is worth noting that any children who live with family that are immunocompromised (i.e. parents/siblings that are at risk of infection because they are having chemotherapy, have leukaemia etc) are entitled to vaccination on the NHS, so please speak to your GP about this. 1) The Dr Mummykins special = time and patience. You need some of the former and a LOT of the latter. – Calamine lotion. (yes, you read right) Despite it having been recommended in the past and used for donkey’s years…someone has now come along and said that actually the lotion tends to dry up and cake into the lesions, in fact making them MORE itchy! – Aspirin. Never give your child aspirin. It is associated with a nasty syndrome called Reye’s syndrome. – Ibuprofen. This is an interesting one… Ibuprofen is given to children when they have a fever. There have been a handful of studies which have shown that in very rare circumstances giving Ibuprofen in chickenpox leads to a very serious life-threatening skin condition. As the jury is out (further studies into this to date have remained inconclusive), we are generally recommending people stay away from using Ibuprofen in chicken pox just in case. I’d love to hear what your opinions are on vaccinating against chicken pox and also what methods you have used to stop your children from scratching! Hi there, is it not true that if you have the vaccine for chicken pox you then are immunised against shingles as an adult? Hi Ruth! That’s what many say. Some specialists go as far as to say that 99% of those who get the chickenpox vaccine won’t get shingles (unlike those of us that naturally catch chickenpox and can be 30% likely to get shingles). I think we will find out exact numbers with time as those who are immunised around the world to chicken pox get older and we see how the vaccine’s immunity lasts and how many of them get shingles. The other thing to note is that there is a shingles vaccine available for older people.